Ally: Remember when we wrote about the group of NS artisans and designers who were setting out to swag-up the ladies of the G8? Well, there is an update! No, sadly, Michelle Obama is not pledging allegiance to New Scotland, but the campaign did catch the eye of a firm based out of LA (not our L-A, the actual place) who invited Michique Handbags, LouLouBell and GlassHarp Gallery out to Toronto to showcase their wares during the Toronto International Film Festival. Exciting, non? Our friend at NSBI sent us some photos to share with you fine people. Kevin Sorbo of Hercules fame. I had a dream about him once. I don’t want to talk about it. Ever. Anyways. Here he is holding a necklace from Glass Harp Gallery. Moving on. 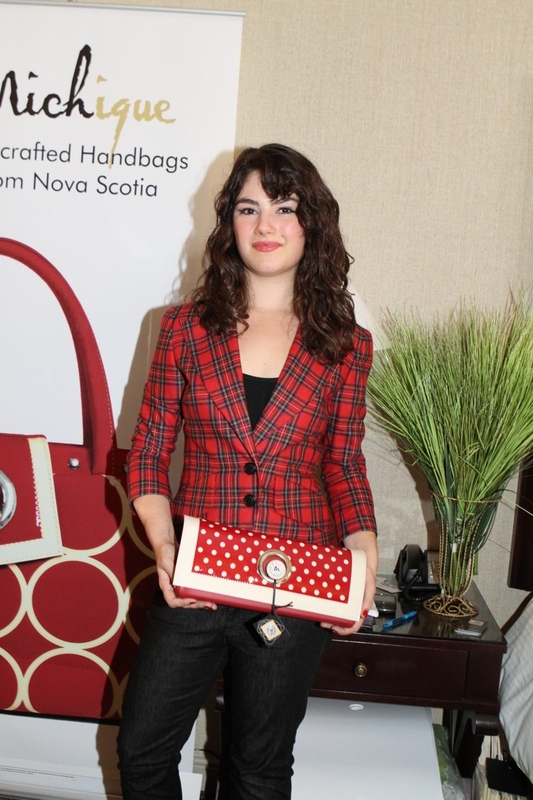 Katie Boland from the film, Daydream Nation holding a Michique purse. Loving her plaid. She should chat with Veronica Mac. Here we have April Telek, former Miss Canada and star of Amazon Falls (which actually looks like a really cool movie). Ok. I’m going to come out and say it. Do all pageant winners always look pageant-ey? Like, I feel as though they just freaking wake up with curly eyelashes and mascara down to their knees. I’m not saying this in a mean way. Ok. I am. She’s pretty. Really pretty. I won’t take that away from her. Also, enjoying the necklace on her. There. We’ve made up. Sook-Yin Lee! I used to find her really annoying, now I sort of adore her. Especially since she is holding a LouLouBell clutch! Cory Lee appearing on Season 10 of Degrassi wearing one of LouLouBell’s amazing headbands (did I mention that I need more of these for Operation Grow my Effing Bangs Out? I emailed Lyndsay and she said I could purchase more headbands and adorable clips on her Etsy Page, or in person at Boutique Joliette where L-A and I bought my first band). Pretty cool stuff, eh? I’m impressed, and glad to hear that the G8 campaign caught the eye of a fancy schmancy firm in La La Land. Well done, ladies. ← Nautical Stripe Challenge Day 2: The Chicken or the egg? Sienna or me?